You just thought I screamed when I saw the baby possum. 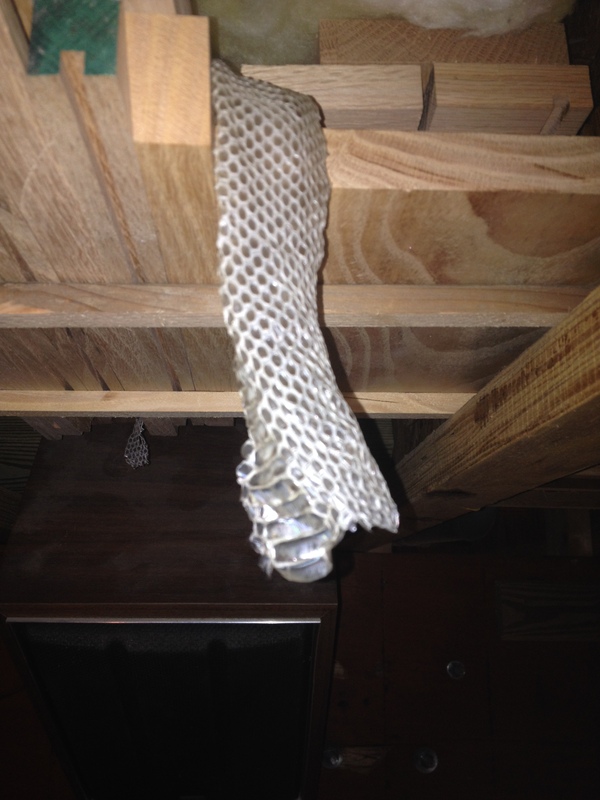 When I looked up and saw this snake skin in the un-likeliest of places, I immediately froze. I couldn’t believe my eyes. Our practice doesn’t include exotic animals, but I knew enough about snakes to know this one wasn’t alive. Still, I was instantly terrified. I knew, at some point, its live owner had been here and could still be lurking. Maybe even right here! “What killed ol’ Jim?” asked one mourner. 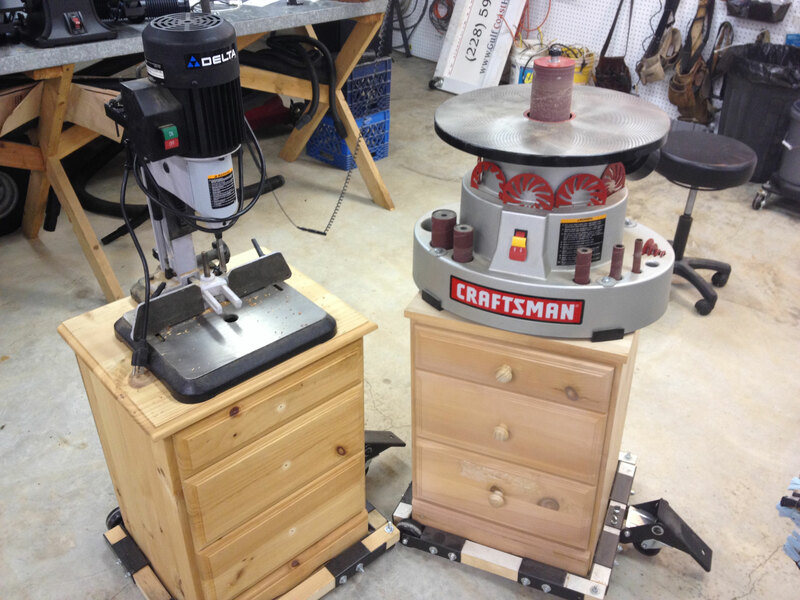 In the March, 2015, issue of Wood News Online we published a tip designed to save you space while making the most of scraps of wood you want to save. The gist of the tip was to use the area between ceiling joists for storage. By arranging materials appropriately, you can store anything from big-enough-to-fit to small-enough-to-sit-on-top-of-the-big-stuff. Of course, there’s a practical limit to how small you really want those smallest pieces to be, yet, it’s ultimately a personal decision. For example, I have some redwood that came from the sign that stood in front of our veterinary practice for 24 years, until Hurricane Katrina knocked it down. 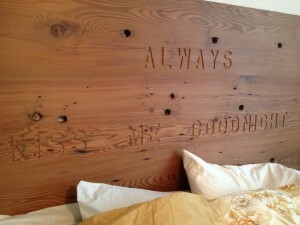 I’ve made some projects out of that wood that are priceless to me. Not everyone is sentimental, much less about wood, but I am, so I have saved some pretty small pieces of that redwood just in case I have some use for a tiny bit of it somewhere. 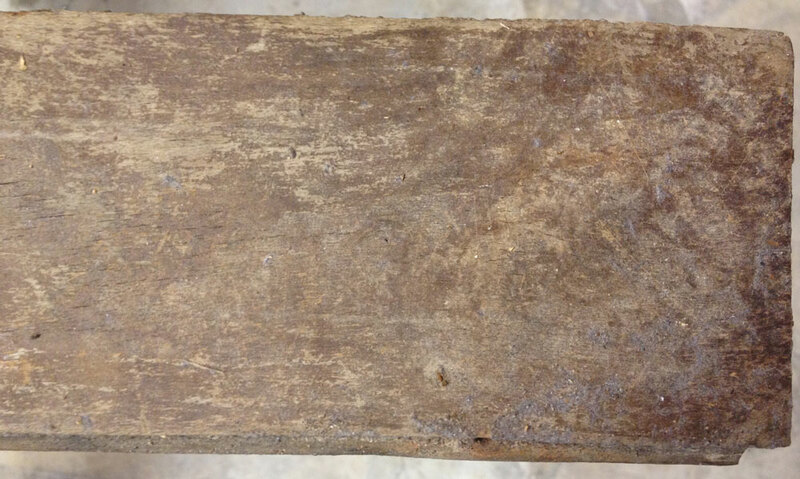 As you can see, some of these redwood pieces are really small, some are really rotten, but every scrap holds a memory, and stands a chance to be fitted into a project someday. The 2×12 redwood boards that made the rails of our pre-Katrina Animal General Hospital sign were planed, sanded and glued up to make this simple, rustic headboard. The engraved phrase came from a Delta Airlines SkyMall catalogue advertising a needlework project. I wrote down the expression while on a flight to see our grandchildren, and kept it tacked to the shop wall for years before finding the right place to use it. 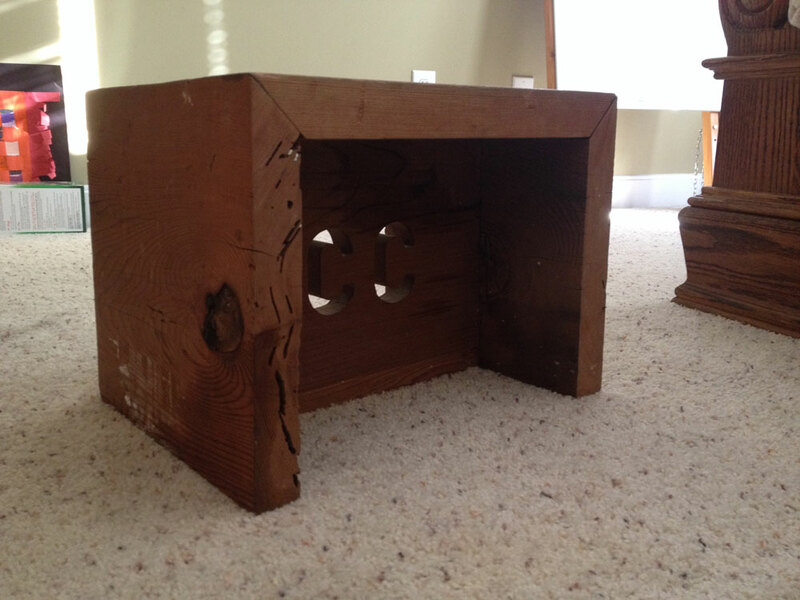 My Grandson Charlie’s stool was made from cutoffs of the same 2×12 redwood. This sign hangs in the automobile-parking area of our garage, which shares space with the woodworking area. There’s a story that goes with the inscription underneath, but that’s for another post. 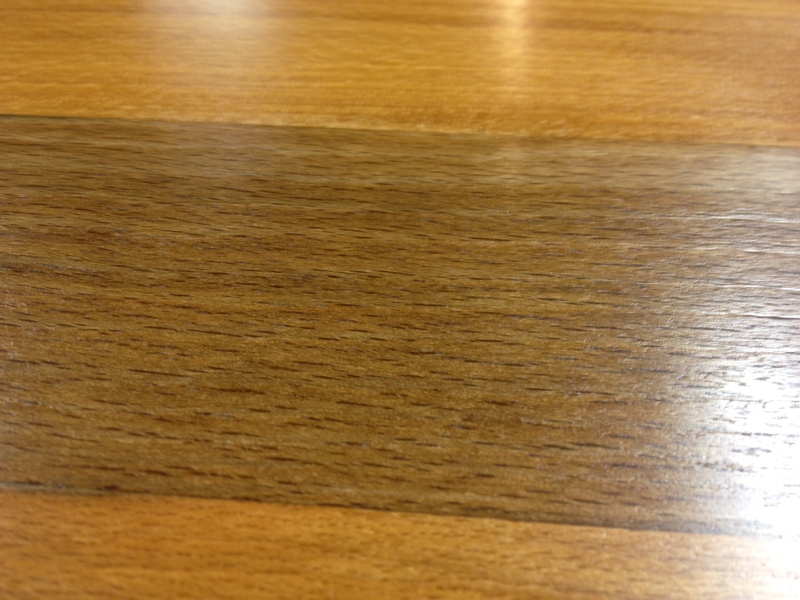 Likewise, I have some oak tongue-in-groove flooring with an interesting backstory. 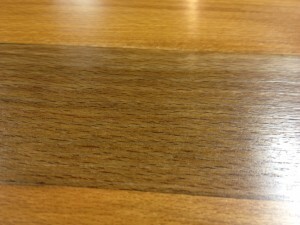 My wife bought some really cheap bedside tables from the “real wood” store, but she needed more top surface on hers. The best I could come up with for short-term use was an old lauan panel I’d attached to some 2x4s with a picture-frame molding around it. It was so ugly that Brenda covered it with a red cloth, awaiting a suitable and appropriate top for her “real wood” chest. That task dwelt on my honey-do list for a long time until, one day, I got the idea to go to Lowe’s for some oak flooring. I could just glue and nail it to a substrate, attach the top, and with a little sanding and some finish Brenda’s new table surface would be ready to reveal itself to the public. Now, this lady didn’t know me from Adam, yet she stood there with her little six-year-old daughter beside her, giving me her address and phone number, like it was 1946. There is still a little trust and innocence in the world! We met, she showed me the old floorboards, and I knew I had found a treasure trove. “Take whatever you’d like, but we still need about this much,” she said, motioning to a small portion of the stack. Well, “stack” might be a little generous. “Pick Up Sticks,” the child’s game, comes to mind when trying to describe the way the boards had been haphazardly thrown into the old garage. I did some selecting as I went. Some were curved along their length. Many were twisted, and I do mean wickedly twisted. Some were cupped. Because these two homes were so close to the Bay St. Louis, MS, beach, they were probably underwater for days after Katrina’s winds were gone. Even the best pieces would require a good bit of milling. But, OH! The character! Worm holes, termite holes, nail holes! 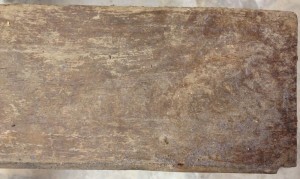 This is what the oak flooring looked like before cleanup and milling. 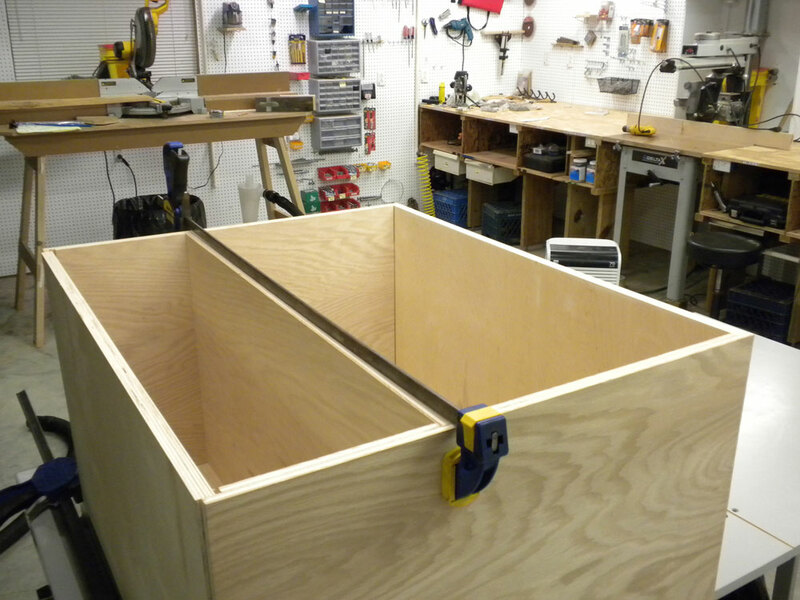 Trying not to be greedy, I took about the square footage I thought I’d need for a big top for Brenda’s side of the bed and a small top for my side, plus about 50% for waste, plus about 15% for miscalculation. There were still a lot of boards left. I could hardly contain my eagerness so I began to unload, sort, and stack as soon as I arrived home. Decades of grit filled the grooves and clung to the tongues, so each piece needed to be steel-bristle-brushed by hand before machining. As soon as the first board came from the planer, I knew I had some epic wood. And, this is what those ugly boards turned into! 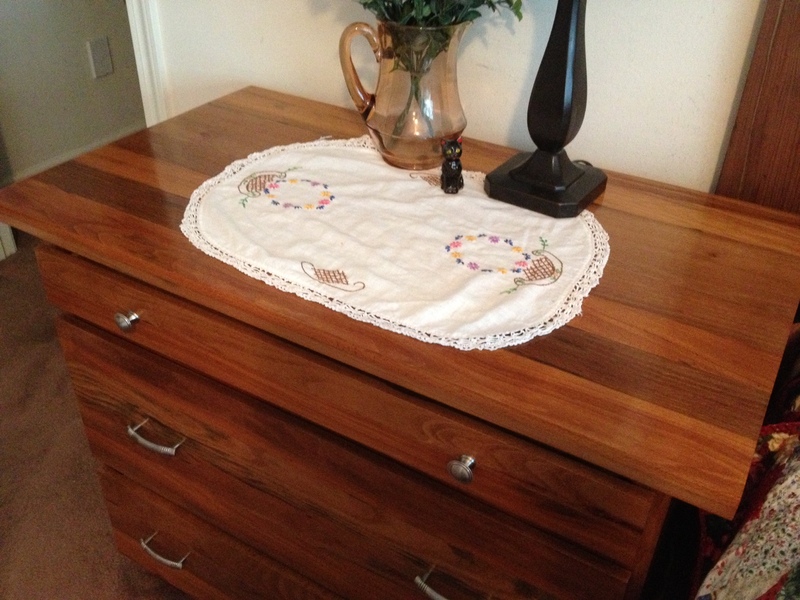 Thus were born the oak bedside tables in the accompanying pictures. 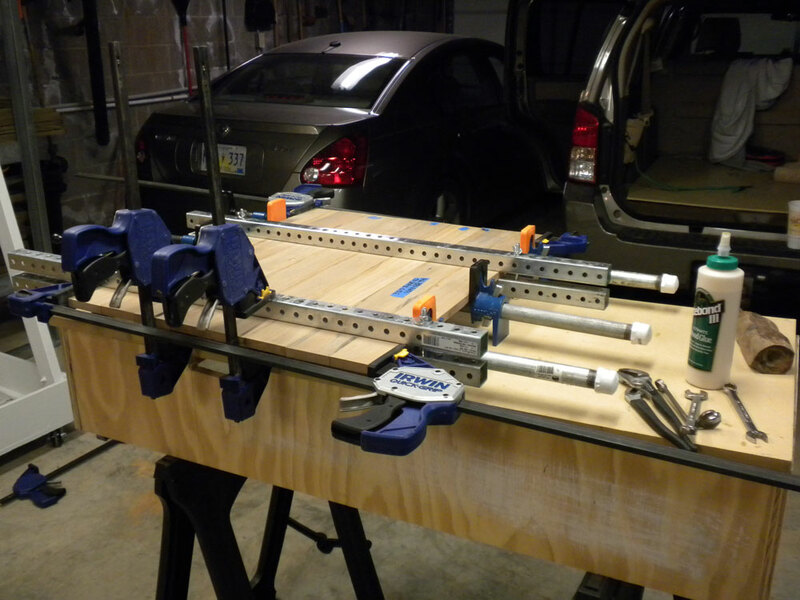 It took several forevers to cull enough boards for the top to make it reasonably flat and produce acceptable joints. Grain-matching was out of the question, so I just tried to keep adjacent boards from clashing. As you can see from the abundance of clamps, keeping this panel flat was a challenge. Stiff, square steel cauls helped. A glue with more open time would have helped too. As nice as it would have been to have solid wood for the sides, there just wasn’t enough material to make panels, but we are fortunate to have a good hardwood plywood dealer close by. I didn’t think it would be possible to stain to match, so I just tried to coordinate. 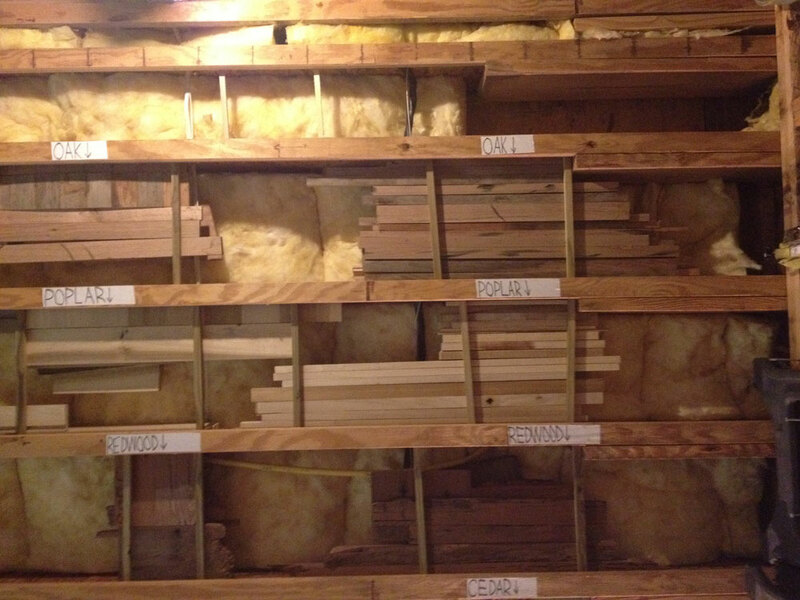 When home center plywood just won’t do, it’s great to have a source for really good hardwood plywood. No voids, no patches, no blemishes. To make the top appear thicker I glued up a 10-inch-wide panel from cutoffs, then cut four strips and glued them along each edge, with a full-width board across the front. Alan Noel taught me his wool-waxing technique via email. CLICK HERE to read Alan’s column on wool-waxing. The technique is as simple as applying wax with 4/0 steel wool and yields a surface with unbelievable smoothness. The project gets Brenda’s seal of approval. Like me, she’s sentimental, and using wood with a story for these two tables makes them all the more valuable. Brenda was pleased with the final result. A smaller, matching unit is on my side of the bed. 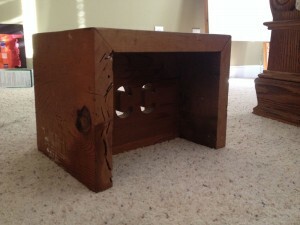 Oh, and the original “real wood” bedside tables? 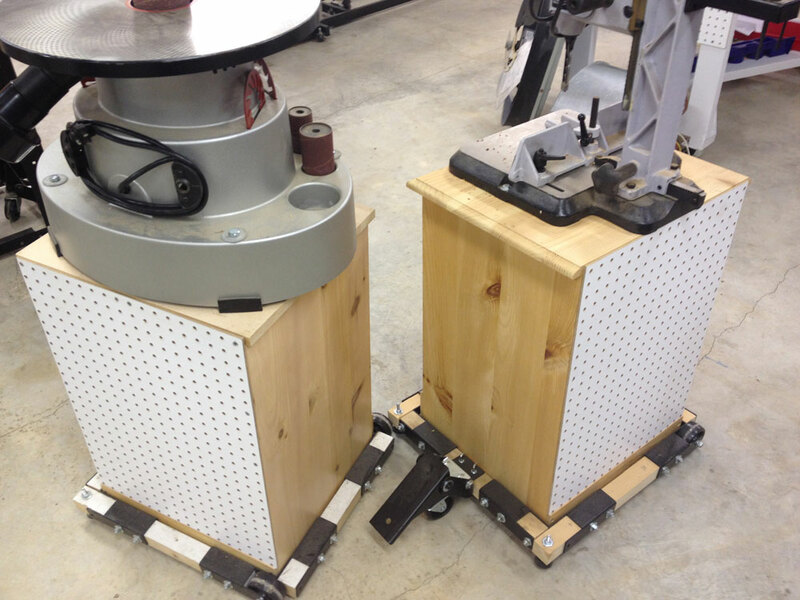 They became rolling stands for our oscillating spindle sander and stationary mortising machine. With drawers to hold accessories, they do a pretty good job. I have mobile bases on every tool in the shop. Not calling for heavy-duty function, these “real-wood” cabinets are up to the job of holding the oscillating spindle sander and stationary mortising machine. Thanks to the rigid portable bases that always fit because you determine the dimensions, they are very stable when in use, and just the right height. As the backs of the units are several inches from the backs of the drawers, they just seemed to cry out for the space to be utilized for storage, so I attached some pegboard. I haven’t found a use for it yet, so I tell myself it stiffens the thin “real wood” carcass. And, the snake skin? I had to use a pair of pliers to pull it down. I couldn’t bring myself to touch it. Trying to figure out how he got there with no ladder, I inquired of a colleague whose practice includes a lot of exotic animals. From a closeup of the skin he said it was probably a rat snake; we have a lot of them around our house. He also sent me a link to a video showing just what good climbers snakes can be. Very good article and nice work. I too, have a fondness for old “free” wood and have a story for all my pieces. I’m 62 years-old and can forget things but one thing I never forget is where I have got each piece of wood in my collection! Forget things? Tell me again, why are we talking about wood? HA! Thanks for reading Michael. I never tire of telling that story because it renews my faith that not all of mankind has become calloused and jaded. That sweet lady knew she had something valuable, yet she was willing to share. I am still touched by her kindness and generosity. Thanks for writing, Michael, and work safely, Jim. I would have never believed I would find someone that did the same thing as me, I have a story for every piece of wood but I have not seen any snakes and when I do I may die. Mechel, I was frozen with terror when I saw that thing, even though I knew it was “just” a skin. 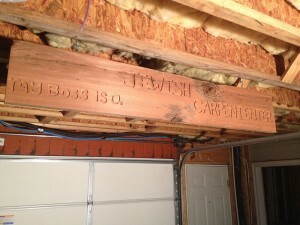 The very first tip Highland Woodworking published in this series is about stories and heritage. You may enjoy it. Click this link to read it: http://www.highlandwoodworking.com/woodworking-tips-1303mar/sticksinthemud.html . Thank you for reading, Mechel, and be sure to share your stories. Jim.